We are delighted to announce the launch of Valiant Wings Publishing and the first in a series of books covering iconic aircraft types in the brand new Airframe & Miniature series, The Messerchmitt Me 262. More titles are already being planned for release. Under the expert guidance of series editor Richard A. Franks, we will be publishing a range of high quality, exhaustively researched books covering popular aircraft types of interest to the avid enthusiast. Each title will contain at least 116 pages of technical information, full colour profiles by Richard J. Caruana, walkaround images, diagrams, camouflage and marking details, a wealth of photographic resource plus comprehensive model builds and information on kits both past and present. Every active aviation modeller should have this series on their bookshelf or by their workbench. 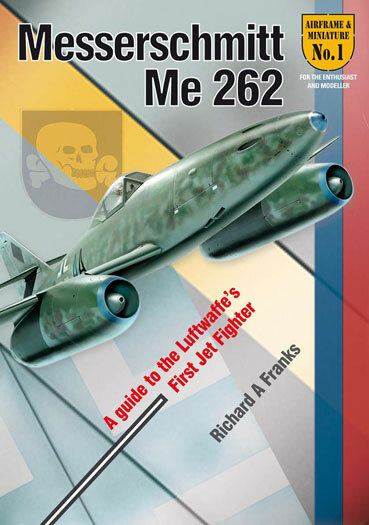 The Messerschmitt Me 262 - A Guide To The Luftwaffe's First Jet Fighter by Richard A. Franks, is due for release in early November 2010, priced at £17.95 SRP, plus postage and packing. Anyone placing advance orders direct with Valiant Wings Publishing prior to October 31st will also get the chance to win one of ten Tamiya 1/48th scale Me 262A-1a kits.